There will be those on the forum who, having read some of my posts, will conclude that I don't know my **** from my elbow when it comes to pigeon shooting. I am happy to agree with that, though I do know spring drillings when I see them. 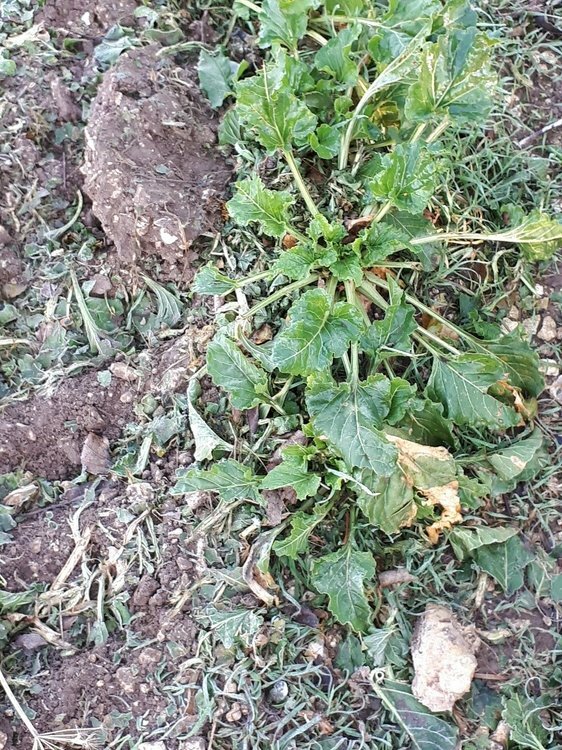 Yesterday I saw drillings after sugar beet which were covered in pigeons so today I thought I would give it a go. On my way to the field at 7:30 I saw the Blood Moon and a beautiful clear sky streaked with vapour trails from jets leaving Manchester and Leeds/Bradford airports and heading for the Continent. 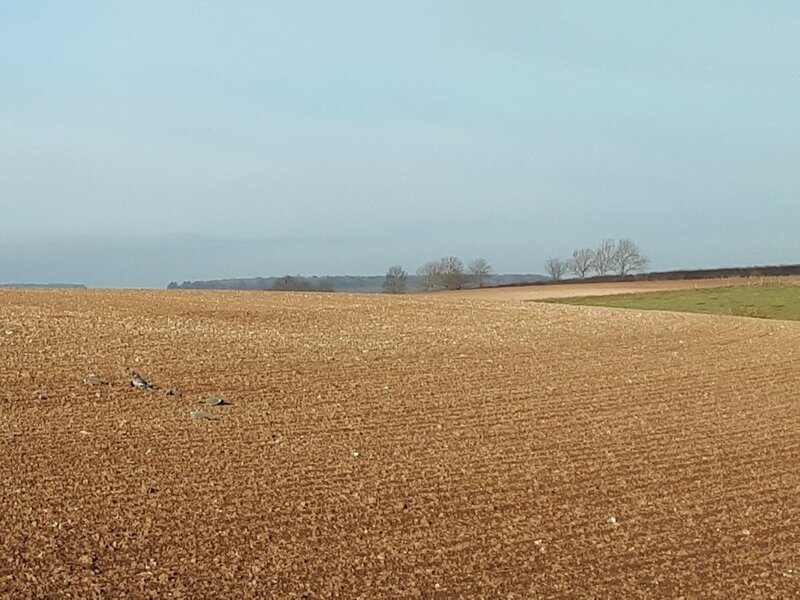 I parked up in a position where I could see the two fields which had been drilled and just after 8 the first birds arrived at both fields from two different directions. I watched for another fifteen minutes or so and I was just about to banger off one of the fields and set up in the other when a thick fog rolled in and grounded me for an hour. During this hour a quad track plus drill, a loader and a tractor and trailer loaded with seed barley passed me by. 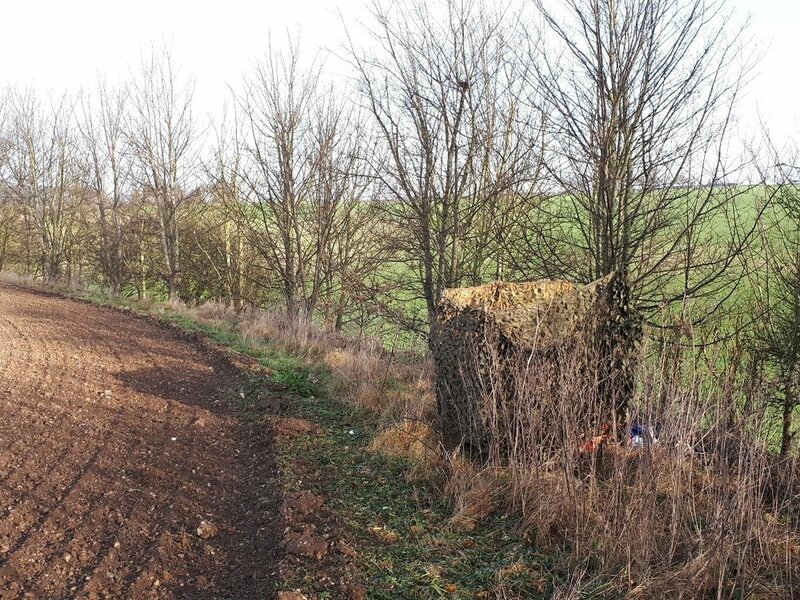 Once the fog had cleared I did banger off one field and set up at the end of the other with fifteen flock coated decoys and four dead bird on spikes. When pigeons began to move they were 200m in the bright blue sky heading nowhere in particular it seemed. The odd one peeled off and came for a look but for an hour not much happened. Reluctantly I put the rotary out but this didn't make much difference and pigeons continued to fly high and wide with only the odd one coming for a look. After another 30 minutes a breeze got up and pigeons did seem more interested in the pattern which was growing in size. No pigeons decoyed into the pattern and I had to shoot long crossers and high passers at the limit of the gun, choke and cartridge and my own capabilities. When I had used up all of the 75 cartridges in my bag I called it a day. On counting the slain 52 pigeons had come a little bit too close for their own good. I mentioned the tractors and the drill earlier. 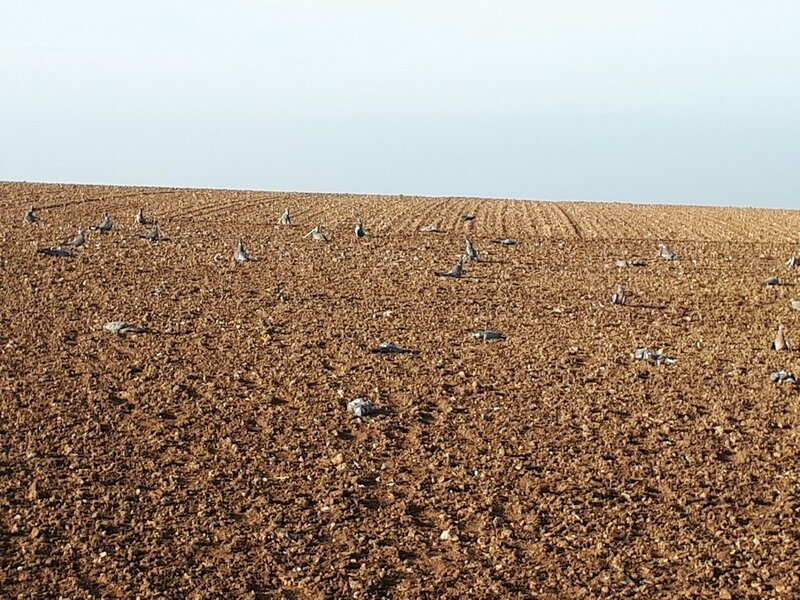 When I packed up I went to find them only to discover that they had drilled two more fields since I saw them and 500 pigeons at least were raking the surface looking for spilled grain. Seems bizarre to be decoying on drillings in January, especially here up north! Will be interesting to see how well these barley crops grow. Never the less you built a decent bag there given the conditions, you will be on the other fresh drillings tomorrow with your 50 dead birds then ? iv just had 2 fields of peas put in. Were they Birdseye Frozen Peas ? You could well be a strong contender Mr JDog for the first bag shot on this years drilling's , although looking at your clear photos it look like Spring have arrived early in your neck of the woods , as ditchman said , it is freezing down hear with another sharp frost this morning and another one forecast for tonight . Well done on a very good bag. Brilliant report and photographs and surely the first report of drillings in 2019. Yes you do know where your elbow is !!! The only criticism that I make is the birds laid flat , it's a quirk of mine that they should all be on spikes some upright and others leaning forward as if feeding. Well done JDog very good result. Walked some plough today that would drill no problem, in fact in my view perfect. All around grass and crops are greener than I have ever seen them in January and one local farm to me has just cut silage!!! It's been a strange winter for sure, but the old British weather has a habit of coming up from behind and biting you. The last hour(2pm to 3pm) today at North Kyme was bitter and was pleased when the whistle went to end the drive. Driving sleat and rain tomorrow. It's been a strange winter for sure, but the old British weather has a habit of coming up from behind and biting you. I have had a data logger running in the garden since mid summer for a project for my daughter, Downloaded this evening and was surprised at the profile, more like September than November, December and January, very strange. Great write up and shooting Jdog, pattern looks good what self respecting pigeon could resist!